Arriving onto the Australian music scene, the Canberra-bred duo of Adam Hyde and Reuben Styles have grown their fan base with their flavour of indie electronica and live sets. Ever since Peking Duk have been voted No. 5 in the inthemix top 50 DJs in 2013, 2014 has seen the duo rise to the top of the charts with their double platinum single 'High' featuring Nicole Millar. Still on the airwaves and dancefloors, 'High' hit the No. 1 spot on the ARIA Club Chart and No. 5 on the ARIA Singles Chart, not to mention No. 1 on the Australian Shazam chart and garnering over 2.2 million spins on Soundcloud and over four million plays on Spotify. 'High' was nominated for “Best Dance Release” at the ARIA Music Awards in 2014. 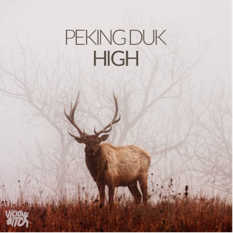 The track is also Peking Duk’s third consecutive ARIA Club Chart No. 1 following on from the success of previous singles ‘Feels Like’ and ‘The Way You Are’. Having played to thousands of new fans across the country this year including shows at South By Southwest in Texas, Ruby Skye in San Francisco and two huge shows at the Miami Winter Music Conference, Peking Duk look set for a big year in 2015. ‘High’ is out 11 January 2015, check it out below.